Who are the members of America's founding generation who contributed the most to our experiment in republican government but whom we don't adequately remember in modern America? This is the question that spurred Gary L. Gregg and Mark David Hall to conduct a survey of top scholars in history, political science and law. The results are the first-ever ranking of the most important and most forgotten contributors to the American Revolution and the creation of our constitutional order. 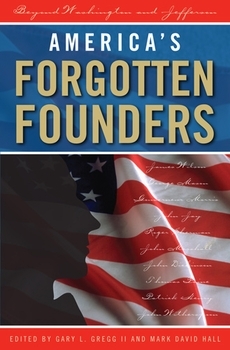 America's Forgotten Founders contains well-written and engaging short biographies of the top ten members of the founding generation who are often overlooked but deserve to be remembered. This unique book contains essential biographical material, summations of major accomplishments, and primary source material from the pens of these forgotten founders.